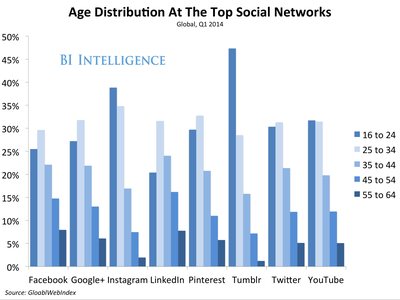 Penetration and population: Facebook remains the dominant social network by a huge margin. This holds true globally and in the U.S. More than 7 out of 10 U.S. internet users ages 18 and up are accessing Facebook, according to Pew’s latest round-up of social-media adoption in the U.S. Gender: Gender is the most notable differentiator on Facebook. Facebook still skews significantly female. Women in the U.S. are more likely to use Facebook than men by about 10 percentage points, according to a 2013 survey of social network adoption. Considering that women’s lead on social networks in general has narrowed to 4 percentage points, it seems other social networks are doing a better job drawing in men than Facebook. Teens: Facebook remains the top social network for U.S. teens. Nearly half of teen Facebook users say they’re using the site more than last year, and Facebook has more daily teen users than any other social network. That said, Instagram has edged out Facebook and Twitter in terms of prestige among young users. U.S. teens now describe Instagram as “most important,” while Facebook and Twitter lost ground on this measure, according to Piper Jaffray’s twice yearly teen survey.